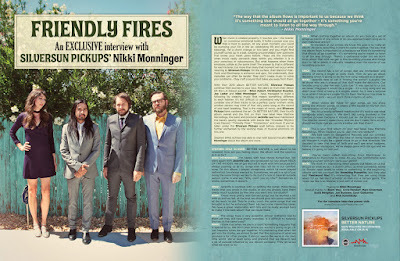 Discussions Magazine Music Blog: SILVERSUN PICKUPS: An EXCLUSIVE interview with Nikki Monninger! 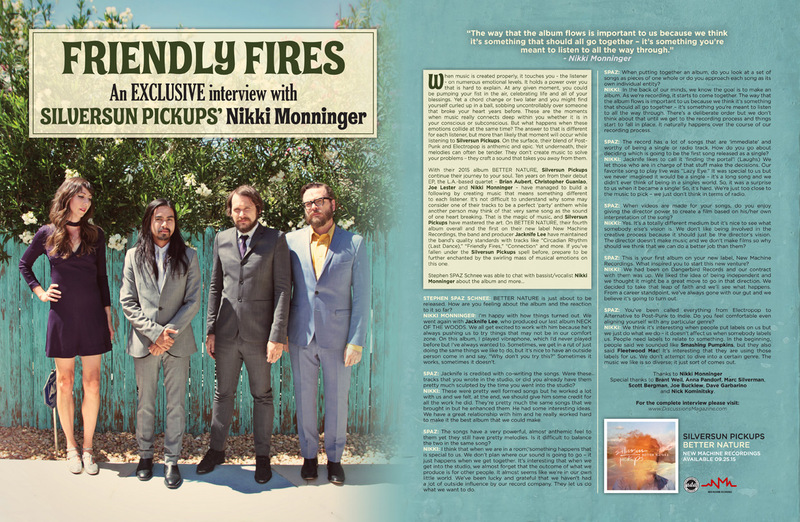 SILVERSUN PICKUPS: An EXCLUSIVE interview with Nikki Monninger! When music is created properly, it touches you - the listener - on numerous emotional levels. It holds a power over you that is hard to explain. At any given moment, you could be pumping your fist in the air, celebrating life and all of your blessings. Yet a chord change or two later and you might find yourself curled up in a ball, sobbing uncontrollably over someone that broke your heart years before. These are the moments when music really connects deep within you whether it is in your conscious or subconscious. But what happens when these emotions collide at the same time? The answer to that is different for each listener, but more than likely that moment will occur while listening to Silversun Pickups. On the surface, their blend of Post-Punk and Electropop is anthemic and epic. Yet underneath, their melodies can often be tender. They don’t create music to solve your problems – they craft a sound that takes you away from them. 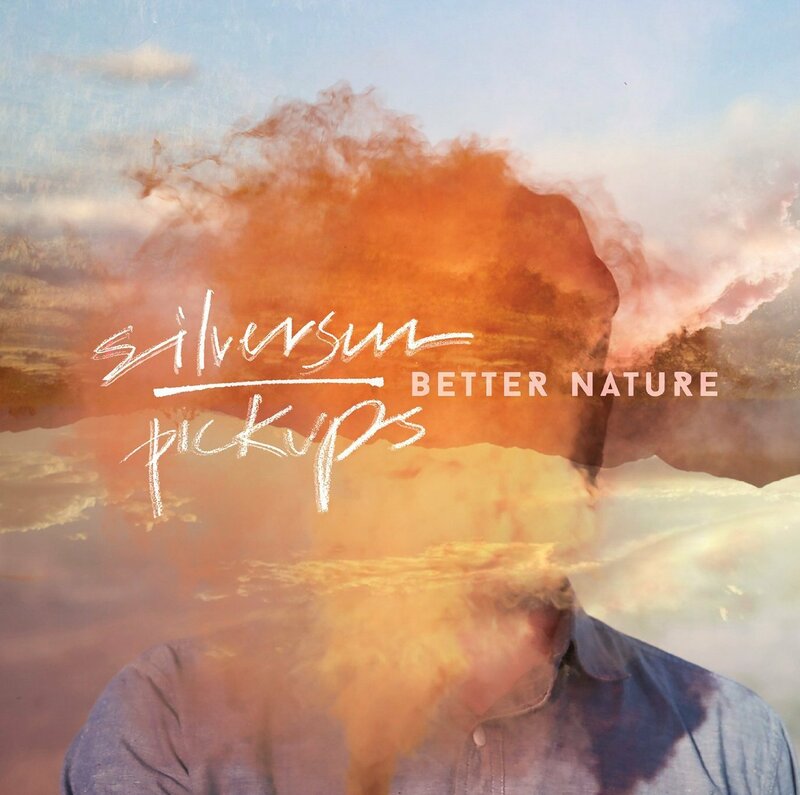 With their 2015 album Better Nature, Silversun Pickups continue their journey to your soul. Ten years on from their debut EP, the L.A.-based quartet – Brian Aubert, Christopher Guanlao, Joe Lester and Nikki Monninger – have managed to build a following by creating music that means something different to each listener. It’s not difficult to understand why some may consider one of their tracks to be a perfect ‘party’ anthem while another person may think of that very same song as the sound of one heart breaking. That is the magic of music, and Silversun Pickups have mastered the art. On Better Nature, their fourth album overall and the first on their new label New Machine Recordings, the band and producer Jacknife Lee have maintained the band’s quality standards with tracks like “Circadian Rhythm (Last Dance),” “Friendly Fires,” “Connection” and more. If you’ve fallen under the Silversun Pickups spell before, prepare to be further enchanted by the swirling mass of musical emotions on this one. STEPHEN SPAZ SCHNEE: Better Nature is just about to be released. How are you feeling about the album and the reaction to it so far? NIKKI MONNINGER: I’m happy with how things turned out. We went again with Jacknife Lee, who produced our last album Neck Of The Woods. We all get excited to work with him because he’s always pushing us to try things that may not be in our comfort zone. On this album, I played vibraphone, which I’d never played before but I’ve always wanted to. Sometimes, we get in a rut of just doing the same things we like to do, but it’s nice to have an outside person come in and say, “Why don’t you try this?” Sometimes it works, sometimes it doesn’t. SPAZ: Jacknife is credited with co-writing the songs. Were these tracks that you wrote in the studio, or did you already have them pretty much sculpted by the time you went into the studio? NIKKI: These were pretty well formed songs but he worked a lot with us and we felt, at the end, we should give him some credit for all the work he did. They’re pretty much the same songs that we brought in but he enhanced them. He had some interesting ideas. We have a great relationship with him and he really worked hard to make it the best album that we could make. SPAZ: The songs have a very powerful, almost anthemic feel to them yet they still have pretty melodies. Is it difficult to balance the two in the same song? NIKKI: I think that when we are in a room, something happens that is special to us. We don’t plan where our sound is going to go – it just happens when we get together. It’s interesting that when we get into the studio, we almost forget that the outcome of what we produce is for other people. It almost seems like we’re in our own little world. We’ve been lucky and grateful that we haven’t had a lot of outside influence by our record company. They let us do what we want to do. SPAZ: When putting together an album, do you look at a set of songs as pieces of one whole or do you approach each song as its own individual entity? NIKKI: In the back of our minds, we know the goal is to make an album. As we’re recording, it starts to come together. The way that the album flows is important to us because we think it’s something that should all go together – it’s something you’re meant to listen to all the way through. There’s a deliberate order but we don’t think about that until we get to the recording process and things start to fall in place. It naturally happens over the course of our recording process. SPAZ: The record has a lot of songs that are ‘immediate’ and worthy of being a single or radio track. How do you go about deciding which is going to be the first song released as a single? NIKKI: Jacknife likes to call it ‘finding the portal’! (Laughs) We let those who are in charge of that stuff make the decisions. Our favorite song to play live was “Lazy Eye.” It was special to us but we never imagined it would be a single – it’s a long song and we didn’t ever think of being in a singles world. So, it was a surprise to us when it became a single! So, it’s hard. We’re just too close to the music to pick – we just don’t think in terms of radio. SPAZ: When videos are made for your songs, do you enjoy giving the director power to create a film based on his/her own interpretation of the song? NIKKI: Yes. It’s a totally different medium but it’s nice to see what somebody else’s vision is. We don’t like being involved in the creative process because it should just be the director’s vision. The director doesn’t make music and we don’t make films so why should we think that we can do a better job than them? SPAZ: This is your first album on your new label, New Machine Recordings. What inspired you to start this new venture? NIKKI: We had been on Dangerbird Records and our contract with them was up. We liked the idea of being independent and we thought it might be a great move to go in that direction. We decided to take that leap of faith and we’ll see what happens. From a career standpoint, we’ve always gone with our gut and we believe it’s going to turn out. SPAZ: You’ve been called everything from Electropop to Alternative to Post-Punk to Indie. Do you feel comfortable even aligning yourself with any particular genre? NIKKI: We think it’s interesting when people put labels on us but we just do what we do – it doesn’t affect us when somebody labels us. People need labels to relate to something. In the beginning, people said we sounded like Smashing Pumpkins, but they also said Fleetwood Mac! It’s interesting that they are using those labels for us. We don’t attempt to dive into a certain genre. The music we like is so diverse; it just sort of comes out. Special thanks to Brant Weil, Anna Pandorf, Marc Silverman, Scott Bergman, Joe Bucklew, Dave Garbarino and Nick Kominitsky.